I received this eBook from Edelweiss in exchange for an honest review. Monster is available for purchase as of the writing of this review. Years after the FAYZ has been eliminated, many of those who lived through the harrowing events of the original Gone series are struggling to live normal, healthy lives in Michael Grant’s Monster. But to make matters worse, the alien virus which kicked off those events has returned and with greater strength in the form of projectiles from space. As they land all over the world, kids and teens are exposed to the virus — both purposefully with the intent of gaining superpowers and by mistake — and the United States government wants to intervene. With both familiar and new characters, Monster brings a new level of thrill to fans of the Gone series. Grant has a history of being called out for being problematic. He and Debbie Reese have come up against each other multiple times, particularly over his depiction of Native American characters. I have an opinion about the whole situation, but it’s not useful or valid to hear more white people talk about it, so I’ll just inform you that it’s a thing that’s been going on and you can decide whether or not you want to engage with Grant’s work from there. I’ll take one more beat to note that Monster features characters who are absolutely transphobic and homophobic, so be aware of that if you choose to read Monster. The remainder of my review will assess the book as separate from the author and these issues. As in the original series, Monster has an excellent cast of characters, all of whom have strong, well-defined motivations, interesting and complete backstories, and personalities that are varied and play well against and with each other. Given the number of books Grant has written, I am always astounded by how thoroughly the characters are developed, both as characters, period, and how they actively develop on the page throughout the narrative. Without being heavy-handed, Grant manages to clearly trace back inciting events and circumstances to explain the actions of his characters and this helps bring a level of realism that is necessary for his high-intensity science fiction world. Along with the intangible realism Grant provides in his novel is the visceral gore he continues to excel at writing. This signature style was one that really elevated the Gone series for me, and its presence in Monster is just as appreciated. Grant’s skill in depicting the grotesque and horrific lies in his ability to do so without cliche and with a great deal of specificity without becoming overly clinical or repetitive. The tedium isn’t held quite as well during fight scenes — of which there are many in Monster — but by the end of the book, it’s clear these moments of physical conflict are leading to something much bigger in a book yet to be published. Monster is, essentially, the first few chapters of the spinoff series, so it’s logical that it sometimes must play the part of exposition. Grant includes interesting pieces of what I’ll call “mixed media writing,” particularly toward the end. These passages include a speech from the President of the United States and tweets. Like the characterizations and gore, Grant somehow finds a way to make these sections heighten the realism rather than cheapening the book, which, from many other attempts I’ve read, is a real challenge to do. For all I’ve mentioned Gone, it’s possible to read Monster (and, presumably, its follow-ups) without reading the original six novels. 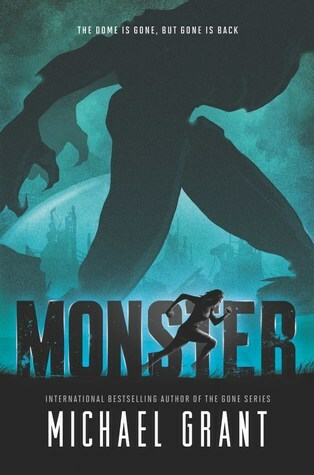 It’s not entirely clear whether Monster is, in fact, part of the original series (Amazon and Wikipedia would have you believe it’s Gone #7) or truly a spinoff (the narrative and characters seem to suggest this — and I feel like Grant himself has indicated this status as well), but Monster includes enough detail about the events of Gone and its sequels that readers new to the world could easily hop on board without reading Gone (though, why you wouldn’t want to read the incredible first six books is beyond me). Monster holds up to Grant’s previous work. It’s just as well crafted as an exciting story with originality, excellent characters, and striking realism within a fascinating science fiction world. The novel is a tough one to put down most of the time, even as a piece that is introducing a new storyline and requires a lot of explanation and exposition which sometimes means sections that feel a little slower. If you enjoyed Gone, Monster is absolutely worth the time and the space on your bookshelf. 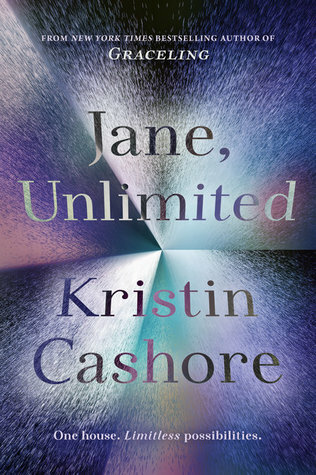 After her Aunt Magnolia makes her promise to accept any invitation to a house known as Tu Reviens, Jane of Kirstin Cashore’s Jane, Unlimited finds herself the recipient of just such an invitation from her former tutor, Kiran. With her umbrella-making supplies in tow and her heart still broken by the death of her Aunt Magnolia, Jane heads to Tu Reviens where a strange cast of characters, from the owner of the house to Kiran’s twin brother to the housekeepers, all seem to have something to hide. While odd things happen around Jane, she’s not sure who to trust and where to go. It all comes down to making the right decision — but what is it? The feeling I got from Jane, Unlimited was, in short, this: (perhaps inspired by E. Lockhart’s We Were Liars), Cashore had a gimmicky idea and placed the importance of that concept over the actual quality of the book as a whole. Like We Were Liars, it’s difficult to talk about the shortcomings of Jane, Unlimited without giving away the bulk of the book. The book is not realistic fiction, but instead mixes fantasy and science fiction in pursuit of the concept in a way that doesn’t feel entirely natural. And, due to the construction of the idea, the idea itself is never fully developed in a meaningful way. So, the gimmick wasn’t executed well and the prose Cashore seats it in doesn’t help. Cashore employs third person, present tense in the novel, combined with a style that I haven’t quite wrapped my head around. Something about the sentence structure is incredibly deliberate and, consequently, distracting. Much of it made the narrative drag even more. While present tense often serves to amp up the tension (ha) and immediacy of a plot, here, though it was necessary for the concept, it seemed only to slow things down. The development of the concept, meanwhile, requires a significant amount of exposition, which further slowed down an already-sizable book at 464 pages. Another aspect bogging down Jane, Unlimited was the sheer number of characters. Although many individuals live and work at Tu Reviens (and, indeed, a party is one of the central plot points of the story), the house always seemed to have an empty feeling. I suspect this was partially by design, but further emphasized by a challenge of character development — again, the victim of the concept of the novel. Too many characters inhabit the story and, without getting to know many of them, the narrative falls short. This, however, has another side — Jane knows as much about the characters as does the reader. Her confusion and such, then, is more palpable and easier to invest in, in some ways. Cashore’s ending — again, a complicated term, given the concept of the book — felt insufficient. Without a better development of the concept, the concept is unable to be resolved and the ending provided by the narrator and all of the frustration built up over the course of the book doesn’t pay off in a way that matters. Jane, Unlimited might do interesting things with allusions (especially Jane Eyre, from my perspective), but the gimmick of the book ultimately provides an excuse for all the flaws in the novel without making up for the flaws. With all the excitement over the book, I was pretty severely disappointed in this one. As one Goodreads reviewer, Sarah, wrote, “I’ve been walking around for days thinking that I don’t like reading anymore.” And, truly, that was my experience with Jane, Unlimited, too. Don’t buy the buzz on this one. You know that cliche about old men yelling at everything that displeases them? I’m basically going to embody that for this review of Ready Player One by Ernest Cline. This book — this book — took me seven months to read. I say this not at all to shame people who prefer a more leisurely reading pace than myself, but to point out that even books that I just kind of dislike I finish in a week or two at most. It’s not unheard of for me to read a book in a day and, in my proudest moment, I read three books in one day (and, no, they weren’t picture books). The point is, I had a really hard time getting through Ready Player One, but everyone who had read it that I knew insisted it was great and the end had a great pay-off, so I read on. Ready Player One is the story of Wade, also known as Parzival in the online virtual reality society is pretty much addicted to in the somewhat-near future. After the creator of this virtual reality dies, he leaves behind clues that promises riches and such if a user can successfully navigate those clues and arrive at the end of the puzzle. As a semi-casual seeker of these clues, Parzival stumbles upon the secrets that professionals have been searching for for years, but he’s not without competition in the form of a cute girl, known as Art3mis, his best friend, Aech, and two Japanese brothers known as Shoto and and Daito. Plus, there’s the evil corporation working as a giant team to not only win the prize, but take Parzival and his friends down. I read Ready Player One on my Kindle, so I relied on the percentage icon to let me know how deep I was into the book. For months, I was stuck around 33%, feeling like no matter how much I read, I was never going to progress any further. The book had to end sometime, right?! After slogging through the prose for the first 33%, I finally realized what was making the book so slow: Cline is a lister. Ready Player One is like a Buzzfeed listicle on Eighties pop culture nostalgia that is about 373 pages too long. I love War Games as much as the next reader, but Cline spends 98% of the novel name-dropping every possible artifact from the collective consciousness of Eighties pop culture and, while it’s cute for a while, it quickly becomes a chore to read through. The problem is that the nature of the book sort of requires you to read through all those lengthy explanations of movies you only-just remember the premise of or obscure arcade video games you’ve never heard of and don’t care about beyond the confines of the book. If you want to solve the puzzle along with our hero, Wade/Parzival, you’re stuck reading every bit. You could argue that this puts you in an interesting position — it essentially gives you first-person perspective on the book, which is almost like a video game if you’re playing along. Cool effect, but maybe better suited for a novella or short story. But even beyond the tell-heavy prose style, I had a hard time getting on Wade’s side. Maybe Cline is just pulling from teenage boy stereotypes (some of which may be accurate, given that Cline was once a teenage boy — I wouldn’t know), but Wade is kind of unlikable. He’s arrogant, first and foremost. He’s also something of a bigot, which plays a huge role of the twist of the end, which I felt was a major point of exploitation. I’m all for unlikable characters so long as there’s something for me to latch on to that will make me care about them anyway (and that doesn’t necessarily have to be some kind of redeeming personality quirk). Sure, Wade’s poor — but who isn’t in this universe? And does it really matter when he spends 90% of his waking hours in this virtual reality where his poverty has little impact on how he lives there? He has enough to sustain himself and he uses the virtual reality as an escape, but it’s pretty evident that the virtual reality isn’t an antagonistic feature in his life, other than the fact that it makes him lazy (or, it enables it, anyway). I wasn’t cheering for him to lose, I don’t think, but I didn’t particularly care if he won, either. Speaking of Wade’s poverty, I never got a true sense of what the world outside the virtual reality was like. Wade’s immediate community is painted pretty well with stacks upon stacks of living quarters piled around each other to create super-vertical communities, but beyond that…nothing. If Cline wants to project his idea of what the world will look like in fifty years, I’d hope he’d spend more time developing what that world is like. The politics of the world’s future are brushed aside in favorite of rolling about in the throes of Eighties nostalgia. Writers should write for themselves and their own entertainment, I agree, but Ready Player One was just a long underdeveloped plot in which Cline indulges himself again and again. I get why people love the whole pop culture thing. It’s fun to reminisce about old favorites and imagine a world in which their importance is greater than we imagine. But at what cost? Ready Player One didn’t do it for me but it’s gotten an impressive rating on Goodreads and is generally favored throughout the reading community. Give it a shot, if you like, but be prepared for a novel listicle. Based on Jane Austen’s Persuasion, For Darkness Shows the Stars begins with eighteen-year-old Elliot struggling to maintain the land and estate of her family while nursing an old heartbreak. In the company of her sister, Tatiana, and controlling father, Baron North, Elliot manages the servants on her family’s land. These servants, a combination of the Reduced and Children of the Reduced (also known as Post-Reductionist or Post), are treated well by Elliot, though others in her Luddite society believe the Reduced and the Posts are serving for their ancestor’s wrongdoings in pursuing genetic and biological enhancement. Fearing for her ailing grandfather’s health, Elliot knows she has to do something to save the family’s estate. When childhood friend and former Post, Kai, returns with a makeshift family to rent Elliot’s grandfather’s land, Elliot seizes the opportunity. But the politics between the Luddites, the Reduced, and the Posts continued to be strained — none more so than those between Kai and Elliot. In a novel that questions the rejection of scientific advancement and the cost of moving forward, author Diana Peterfruend tells an engaging narrative with an exceptional handle on language and memorable characters. Peterfreund employs a near-perfect language in her nontraditional post-apocalyptic dystopian novel. With vocabulary and sentence structured which loosely mirrors Austen’s original text, the novel not only reminds the reader of its source material but easily reflects the lives of the Luddites who star in the story. Peterfrend throws in the occasional exclamation with a more modern sound to it, which serves to emphasize the futuristic setting which might otherwise be forgotten. Peterfreund consistently chooses just the right word to portray captivating moments. In one instance of heightened emotion, Peterfreund describes Elliot’s flesh as “burning” where many authors would instead choose “warmed.” Choices such as this one really make this science fiction particularly human and approachable. Peterfreund also does well on world building, giving the reader enough information to enjoy the story and appreciate the content of Elliot’s problems without overloading on detail. For readers looking for more on the background of the society, Peterfreund has written a prequel as well as another novel which takes place in the same universe and is a retelling of The Scarlet Pimpernel. Readers who shy from science fiction due to the sometimes-overwhelming world building need not avoid this novel, which is based more in the matters of the heart than of the machine.